You may have seen a few posts back the exclusive interview with Kelvin Torve, whose “accidental” issue of the 24 jersey in 1990 caused a minor stir among Met fans and a major event in team history when viewed through the numeric prism. Photographic evidence of the event was difficult to come by, to say the least — even a thorough re-examination of Mets Inside Pitch issues from 1990 produced nothing. 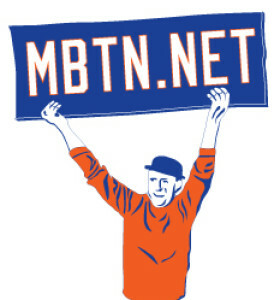 That was before MBTN user TommieCleon (aka Paul C) stepped up to the plate, and just like Kelvin Torve on Aug. 9, 1990, smashed one off the wall. Pictured here are videocaps from that historic occassion — not only one of the few games Torve spent wearing No. 24, and not only his best moment — his pinch double drove in 2 runs including the game-winner and made him a hero — but for the lengthy, violent, bench-clearing brawl that occurred only an inning before. 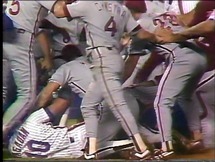 The brawl was precipitated when Phillies pitcher Pat Combs returned fire to Dwight Gooden, then hitting. 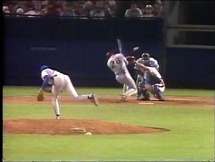 Gooden earlier in the game had hit Phillies Dickie Thon and Tommy Herr with pitches. 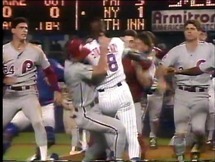 Tension between the Mets and Phillies had dated to a year before when Darryl Strawberry and Darren Daulton tangled. 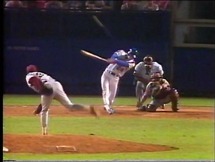 Gooden charged Combs after the pitch struck him in the leg in the 5th inning. “You go with your first reaction and mine was to get him,” Gooden later recounted. The ensuing melee, a “Pier 6 Brawl” as Bob Murphy might describe it, lasted nine minutes and halted play for 20. 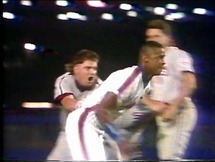 Strawberry went after Daulton but was interrupted by Von Hayes and they went at it. 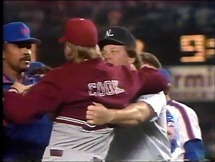 An obscure Phillie reliever we’d come to know, Dennis Cook, was yanked from the pack and thrown to the ground by umpire Joe West, and then he really got mad. 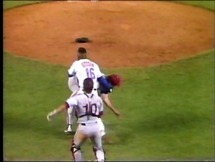 Met outfielder Kevin McReynolds wrenched his back in the scrum. 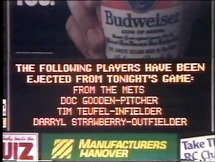 In all six players (Strawberry, Gooden and Tim Tuefelfor the Mets; and Combs, Daulton and Cook for the Phils) were ejected, along with Phillies bullpen coach Mike Ryan. 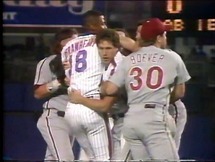 Expect this game to be referenced often as talk heats up of the Mets and Phillies renewing hostilities this season. Based on materials in the public record concerning the Mets issuance of uniform #24, I think that present management is not inclined to retire the number. Of course, this is somewhat obvious based on the simple fact that the Wilpons still haven’t retired the number in the almost 30 years that they’ve owned the ballclub. Still, Kelvin Torve might have been a guinea pig in a calculated ploy to gauge public sentiment over the reissuance of #24. Perhaps there is a better explanation for Torve as #24, but to me, the notion that either Charlie Samuels or Met management forgot about the significance of reissuing the number is simply implausible, no matter how momentary this alleged lapse in memory was. The Mets solution to this uni controversy appears to be a compromise; keeping the uniform mostly in limbo is consistent with their own view against retiring the number. By allowing the uni to be reissued to a special player, (e.g. Rickey Henderson, a first ballot HOF’er and one of the two or three dozen best players of all-time), Met brass appears to be minimizing instances of fan disappointment. After all, one would think that the benefits of acquiring that special player would outweigh whatever negativity might arise from having that player wear #24. As you admire this awesome collection of historic Met bloodshed which Paul was cool enough to provide, give some thought to his points above: What should the Mets do with 24? How cool was this brawl? And how awesome do the numbers look without the awful drop shadow? Submitted by metirish on Tue, 02/26/2008 – 1:44pm. Pretty good Tidewater numbers, interesting with all the talk about fighting this early spring training that we have this one to look back on, my money says that any fight this season between the Mets and Phils won’t come close to this donnybrook. Submitted by Mets2Moon (not verified) on Sat, 03/01/2008 – 1:43am. This has always been one of those games that is referenced as an afterthought, but more often than not forgotten entirely. Yet there were so many memorable things that came out of this game. 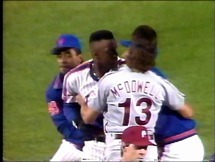 This was in a period of time where there was more than a little bad blood between the Mets and Philly (there was the Gregg Jefferies/Roger McDowell dustup in September 1989), and I remember this brawl being especially nasty. 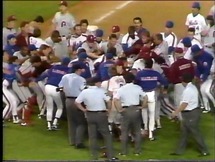 I was at the game, albeit 11 years old at the time, and aside from the brawl, and Torve in #24, few remember that the Phillies really knocked around Gooden in this game. 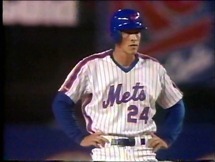 If I’m not mistaken, Philly had 16 hits to the Mets 7–Dykstra had 4 or 5–but the Mets ended up coming back from 3-1 down in the 6th against Darrell Akerfelds with a Ho-Jo HR and Torve’s 2B. Lots of little things in this game get lost. Thanks for showing these photos–it brings back alot. Submitted by Jon Springer on Sun, 03/02/2008 – 8:51pm. The odd thing is I remembered all those events but not as they unfolded when I spoke to KT, so I didn’t think to ask him about the fight. He never mentioned that part either. Thanks of course to Paul for the photos — he sent along lots of other cool stuff we can get to as time goes on. Submitted by Daviault62 (not verified) on Tue, 03/04/2008 – 9:52am. 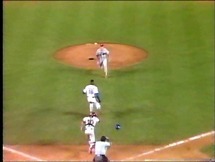 I have a photo of the Shea scoreboard from Aug. 16, 1990, which shows No. 24 playing 1B and batting 5th, so Torve had that number for at least 7 games. Willie Mays was one of the greatest players I’ve ever seen, and I understand the reluctance to give his number to any player who comes along, but he was a Met for less than two seasons and his contribitions to the team pale beside the likes of Keith Hernandez, Jerry Koosman and yes, Darryl Strawberry, whose numbers are given willy-nilly to utility players and middle relievers. Submitted by Jon Springer on Wed, 03/05/2008 – 1:32pm. Kelvin’s recall of events (that he wore 24 thru the end of the homestand before going on the road) checks out with the “official” record we’ve been able to verify. Mays was and is a strange case,. I was doing some research the other day when I came across mentions that, although he was being paid 50K to be a coach for the Mets in 1976, he hadn’t in fact showed up at spring training that year. I’d love to see your photo, you can shoot it to mbtn01 —+ at — gmail (dot) Com. His one and only advocate in the org I think was Mrs. payson who wasn’t much use to Mays after she died. I think it’d be a nice gesture and provide some closure on the whole affair to retire 24 for Mrs. Payson.